I'm headed to Good Morning, Texas today. It's all about the sparkle. This is one of three projects. I'll post the third one soon. In the meantime, I'll post the video to my facebook page with today's segment. In the meantime....here is a sneakpeak. I blogged about this easy recipe for making cinnamon almonds in the crockpot a few weeks ago. I decided this would be one of the gifts I give this year for Christmas because they are fab-u-lous and easy to make. 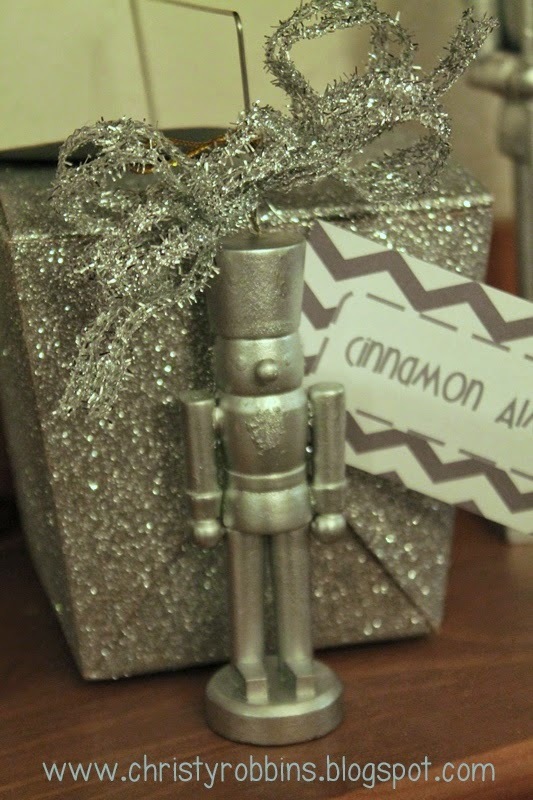 I put them inside little silver boxes and added these silver nutcrackers I made. I yanked off the beards (like the guy on the right). The guys I got for a dollar were easiest b/c they were just glued on the edges. I sprayed them with a little silver spray and they are good to go. I plan to put the larger guys with some crystal candles and clear glass ornaments on my buffet. The little nutcrackers are hitching a ride on the nuts I'm giving away to friends this year. Stay tuned, more glitter coming soon.